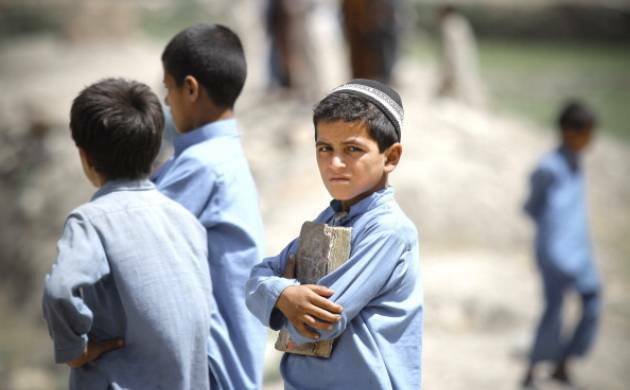 KABUL: Nearly half all children in Afghanistan are out of school due to conflict, poverty, child marriage and discrimination against girls, the number rising for the first time since 2002, humanitarian organizations said in a report on Sunday. Spreading violence has forced many schools to close, undermining fragile gains in education for girls in a country where millions have never set foot in a class room. Some 3.7 million children between the ages of seven and 17, or 44 percent, are out of school, 2.7 million of them girls, Education Minister Mirwais Balkhi told a seminar, explaining a study conducted by UNICEF, USAID and the independent Samuel Hall think-tank. The Taliban, seeking to oust the U.S.-backed government and return the country to strict Islamic rule after their 2001 ouster, are adamantly opposed to education for girls and threats from Islamic State have forced the closure of dozens of schools. Without mentioning the Taliban or Islamic State, Balkhi said there were “many reasons” for children not going to school. In the worst affected provinces, up to 85 percent of girls are not going to school, the aid groups said. They did not give specific time periods or comparisons. In April this year, militants set ablaze two schools and widespread violence had led to closure of hundreds of private schools. “Business as usual is not an option for Afghanistan if we are to fulfil the right to education for every child,” said Adele Khodr of UNICEF in the report. One teenage girl, Ziwar, from central Daikundi, one of the safest provinces in the country, said she had been at school until she was 14. In Mazar-i-Sharif, capital of the northern province of Balkh, one girl was killed and 20 were injured in a stampede at a school as they rushed to collect their university entrance exam passes on Sunday.